cute post! “um, it’s red, tastes pretty good, I like it” is exactly how i take wine notes. sometimes i can even remember the name of the winery! Good work, John. As a kid, my family and I passed right through the heart of VA wine country on our way to see family further south. But I’ve never had the opportunity to stop for a winery visit. BTW, I think the absence of those vegetal and herbal notes, which are natural to Merlot but get pushed out when over-ripeness is sought, is one of the reasons that the death knell seems to have sounded for new world Merlot. Without those traits, the wines too often lack character. Good to hear that you found them present in your wine. 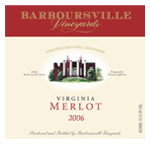 We’ve had the 06 Merlot from Barboursville, and I agree with you—a very enjoyable Merlot and you can’t beat the price. Paul brought a bottle to a family gathering this summer, and it was a hit.